29th FA Bn - On Board the USTS Hermitage...! Coming Home - July, 1945! USTS Hermitage, docks July 10, 1945! The 29th Field Artillery Battalion, known to the grey-uniformed Wehrmacht as "The Beasts of Hurtgen Forest", supported the 8th Regiment of the 4th Infantry Division during 11 months of combat on continental Europe - from Utah Beach, Normandy, to the heart of the Third Reich. The story of the 29th and the 4th follow the same pattern, as the tides of battle carried the artillerymen and infantrymen over virtually identical routes during five major campaigns through four countries of Europe - France, Belgium, Luxembourg, and Germany. H-Hour, D-Day, saw many of the men aboard this ship who are wearing the red piping on their overseas caps, swarming shore on the coast of France with the initial assault waves. From that time on, from the so-called St. Lo break-through, to the liberation of Paris, the bloody battle of Hurtgen Forest, the historic stand before the City of Luxembourg, and the subsequent crossings of the Rhine and Danube rivers, the 29th was letting loose with its big guns in support of advancing infantry. The magnificent record of the 29th was not attained without sacrifices of American lives. On D-Day one of its batteries was knocked out by a floating mine, but three days later - - it would have been sooner only the whereabouts of U.S. paratroopers was uncertain - - the 29th was bombarding German positions. In the Hurtgen Forest the 29th often-times was called upon to lay down fire a mere 50 or 100 yards in front of U.S. infantrymen, and it was during this epic struggle that the Germans fearfully named the crack artillerymen "The Beast of the Hurtgen Forest." Three rounds - - one a high explosive, another an air burst, and the third a white phosphorous shell - - all fired at the same coordinate, comprised the "The Battalion Hot-Foot." The 29th, which, with Dog Battery of the 70th Tank Battalion, fired a total of 182,000 rounds of ammunition at the enemy, is commanded by 29 year old Lt.Col. Joel F. Thomason, of Rock Hill, N.C., a D-Day man, himself, who wears, in addition to the American Defense Ribbon and an ETO Ribbon with five stars and the Invasion Arrowhead, a Belgium Croix de Guerre, Silver Star, Bronze Star, and a Purple Heart. Colonel Thomason is a graduate of the United States Military Academy with the class of 1939. Since the 29th was activated in September, 1940, two former commanders have risen to the rank of General. They are Brig. Gen. John Lentz, now with the XII Corps, and Brig. Gen. Robert Q. Brown, of SHAEF Headquarters. The 29th was originally a regiment, and when the 8th began training at Benning the First Battalion of the artillery outfit was assigned there. Later, when the 4th Division was triangularized, the 29th was broken up into the 29th, 42nd, and 44th, with the First Battalion retaining the original name. The Battalion's motto from the ranges of Oklahoma to the western European front, was, "Put the proper amount of fire at the proper place at the proper time." Doughs who slogged ahead many a mile under a curtain of friendly protected fire will tell you the 29th did just that, especially during the battle of Hurtgen Forest when "The Beasts" lobbed their famed "Battalion Hotfoot" at the entrenched enemy a scant 50 yards in front of the 8th Infantry. The above is a "trancript" of an article published on board the USTS Hermitage in July 1945! 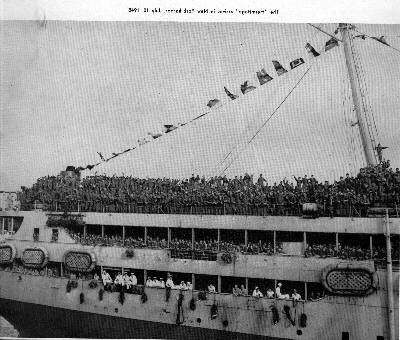 The 29th Field Artillery Battalion returned to the United States on board this vessel, docking on July 10, 1945. Photo and story provided by Irving Smolens, the author of the article is unknown. Some of the original wording has been edited.